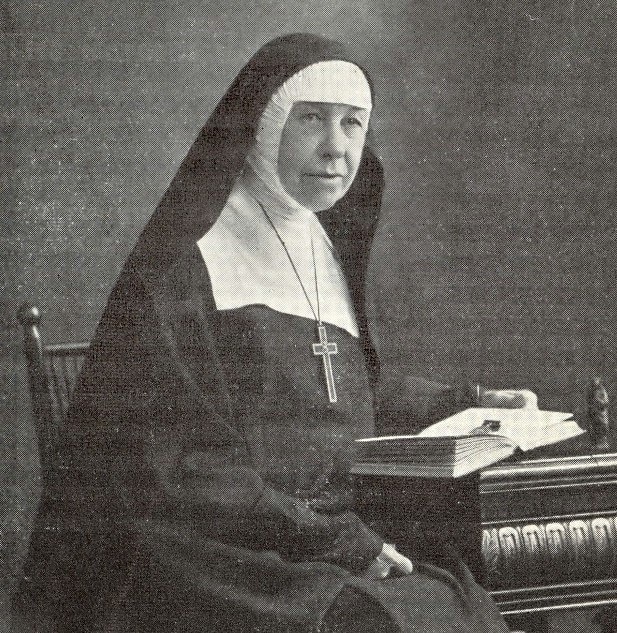 Hannah Grier Coome (28 Oct. 1837 - 9 Feb. 1921), the founder of the Sisterhood of St. John the Divine in 1884, was born at The Carrying Place, Ontario, in 1837, the sixth of 13 children. Her father was an Anglican priest from Northern Ireland; her mother was of United Empire Loyalist stock. She appears to have had a very ordinary childhood with no hint that she might later become a pioneer in the difficult task of founding an Anglican religious order in Canada. It is said that on at least one occasion, she skipped church to make doll’s clothes. At the age of 21, she married Charles Horace Coome, an English engineer who was working on the building of the Grand Trunk Railway. It was clearly a happy marriage, for many years after his death, she wrote of her hope of meeting him again in heaven. One major event did mar her happiness: a fall during her pregnancy which resulted in a miscarriage followed by five years of suffering and invalidism. Certain themes in her married life carried through into her religious life. First, her miscarriage probably influenced her decision to found Toronto’s first hospital for women. Second, her husband’s work took the young couple back to England in the 1860s. Here she was much influenced by the Liturgical Revival, by the Anglo-Catholic movement in general, and in particular by the Anglo-Catholic parish of St. John the Divine, Kennington, and the Sisters of St. Mary at Wantage. The Sisters of St. Mary ran a settlement house in the slums of Kennington. Hannah Coome worked with them there, added to her skill at needlework under their tutelage, and became so enamored of the religious life that her husband used to joke that he expected to come home one night to find that she had joined them. There’s another story, from the same period, that is quite delightful: her father was visiting from Canada and insisted that she take him to her parish church one Sunday. She was worried that he might find the church too “high” even for his taste, describing the scene as follows: “It was in the Trinity Season, and the vestments were an iridescent green with the metallic sheen of a Mexican Beetle, and there were three great green beetles at the Altar!” As it turned out, her father was not horrified by either the “beetles” or the rest of the ceremonial; on the contrary, it struck as much of a chord in his heart as it obviously had in his daughter’s. When Hannah first turned her thoughts to the religious life, it was natural for her to consider joining the Sisters of St. Mary at Wantage. However, on her way home to England after her husband’s death in Chicago, she stopped off in Toronto to visit her family. While there, she was approached by a small group of people who were eager to see a Religious Community founded in Canada. They broached the idea of her undertaking this rather daunting task instead of joining St. Mary’s in England. After much prayer and thought she accepted it in faith and agreed to go to St. Mary’s, Peekskill, an Episcopalian order in New York State for her novitiate. There were mixed feelings about Hannah’s time in the novitiate at Peekskill. Some urged her to come back to Toronto at once, ‘just as she was’ but she had great faith in Mother Harriet’s ability to produce the necessary changes in her to start a new Community. This caused Fr. Ogden Ford, the first Warden of our Community, to say he hoped she would not change too much. Even the Novice Mistress at the Community of St. Mary (CSM), Peekskill, said of Hannah Grier Coome, “I fail to see why she was sent here to be trained”. There were others who feared that Hannah’s strength might not prove equal to the strain of the novitiate with all the other business pressing upon her at that time; to them the Novice Mistress replied: “You need have no fears for your dear Hannah. She has a true Vocation and God will give her the necessary strength.” Apparently Hannah’s witty sayings, however, were not always appreciated by the Novice Mistress and her buoyant spirit was thought to need some discipline! Sr. Winifed, CSM, who was a member of the novitiate with Mother Hannah remembered her as being capable in numerous ways, especially in the embroidery of vestments and altar linens. Somehow she found time to sew most of the altar vestments for the new Canadian Community. Sr. Winifred also gives a delightful anecdote of Hannah when she was sent out on a visit to a particular ministry in the city. She was greeted at the door by a man dressed like a butler who appeared to be a trusted servant. He showed her all around explaining the background of this special work of the Diocese and then said something that made her realize that he was the Bishop. She was greatly embarrassed and said: "Oh! My Lord, I beg your pardon — I had no idea — I did not see your apron — I am so sorry!" (He was not wearing either the apron or gaiters which would have identified him to her as a bishop.) On the day of her Life Profession, the Bishop came to the Community Room and said to Mother Hannah, "Is there any mistake as to my identity today?" The Sisters of St. John the Divine are dedicated to the undivided service of Our Lord Jesus Christ after the example of the Beloved Disciple whose name they bear, for the fulfilment of the two-fold law of Charity. Like St. John, they are called to find their joy in fellowship with our Lord and for this end to forsake all worldly distractions. The Sisters of Saint John the Divine, in the spirit of their patron, are called to live to the glory of God in fulfilment of the two-fold law of love. Each sister will seek to do everything as one who has been baptized into Christ’s death, and has entered into the new life of his resurrection, by the power of the Holy Spirit. “…all our work is an extension of prayer and a way of growing in our relationship with God and our neighbour” and “All work is of equal value in nurturing the common life and the witness of the community”. The first house for the Sisters on Robinson Street was originally a stable and very different from our beautiful, spacious convent of today. It was actually two houses joined together and very simply furnished with three very hard beds and a few chairs, a table, a dish-pan, coal-scuttle, and shovel. When the Sisters moved in, there were bed linens, some plates and cups and saucers, a few provisions, a kettle and frying-pan lent to them by the rector of St. Matthias but no lamps. A divinity student living across the street produced a lamp and two candles in bottles to illuminate their first meal. The chapel was tiny but had everything necessary; all the altar vestments had been made by Mother Hannah during her novitiate. On the Feast of St. John the Evangelist, 1885, the house—the smallest Convent, perhaps, ever known—was formally opened and blessed by the Bishop of Toronto. Only months after founding the Community, Mother Hannah was asked to go to Moose Jaw to nurse the soldiers wounded in the Northwest Rebellion. With only one novice, two postulants and three fully-trained nurses she travelled by boat from Owen Sound to Fort William and from there by the very new and ‘jolty’ railway. It was on the boat trip that Mother Hannah realized they were not going to be able to care properly for their hair, so she cut off her lovely, long black hair and dropped it overboard. When they arrived in Moose Jaw they discovered the base hospital was a large frame building lined with black paper with as yet no furniture or decoration of any kind except large “no smoking” signs. She was given the keys to the building and asked to make it into a hospital! This she did and received a medal that is among the sisterhood’s prized possessions. On returning to Toronto a few months later they discovered that friends and benefactors had set up the first St. John’s Hospital in a small house connected to the convent by a covered passageway. It possessed little in the way of surgical equipment, but had several private rooms for paying patients and a ward with eight beds for those who needed free care. 465 patients were cared for there in its first three years. In 1889, Mother Hannah (together with 3 Life-Professed Sisters, 5 novices and a postulant moved from that tiny Convent to a a new convent and hospital on Major Street built with the money raised by friends and Associates of the Community. It was expected that the Community would grow in numbers and by 1898 there were 22 active members in the Community, and their regular work comprised St. John’s Hospital for Women, the Church Home for the Aged, the Seaton Village Mission, Bishop Bethune College at Oshawa, the Kindergarden on Major Street, and also the Church Work Room and the Altar Bread Department — quite an impressive list of ministries for 22 Sisters. And that is still our ministry today: to do whatever he tells us to do. This is Mother Hannah’s legacy. She was a woman of vision and great courage but she was also practical and down-to-earth with a delightful sense of humour. The Sisters of today are blessed to be part of her vision.